Headmaster Jonathan Brougham welcomed religious scholar, educator, and NY Times bestselling author Reza Aslan to The Hun School on Tuesday, January 28th as part of the Centennial Speaker Series: The Next 100 Years. Dr. Aslan’s presentation “Unity in Diversity” examined the shifting landscape of America’s identity. 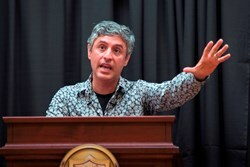 Reza Aslan spent the day at The Hun School of Princeton as a guest in the Centennial Speaker Series: The Next 100 Years. What we have done in this country is a miracle. The fact that we have managed to figure out a way to take the most diverse nation in the world and transform it into this sense of unity is mind-blowing. 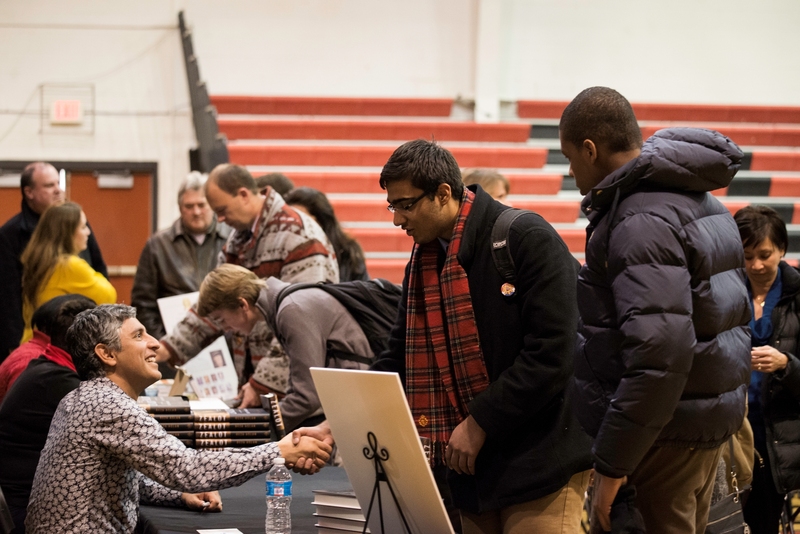 Headmaster Jonathan Brougham welcomed religious scholar, educator, and NY Times bestselling author Reza Aslan to The Hun School on Tuesday, January 28th as part of the Centennial Speaker Series: The Next 100 Years. Dr. Aslan’s presentation “Unity in Diversity” examined the shifting landscape of America’s identity. Dr. Aslan emphasized how relationships are the key to recognizing the humanity in one another, and why relationships are the single most important determinant in bridging differences such as religion, race, and ethnicity. As America’s identity continues to transform, and as the country moves ever closer to becoming the first nation whose majority is minority, Dr. Aslan sees a need for greater understanding of how diverse people can continue to live in unity. Following his presentation, Dr. Aslan met audience members and signed copies of his books. Later, he joined faculty for lunch and small group discussions, where the topics of education, pedagogy, international relations, and history were explored. Reza Aslan is the author of "Zealot: The Life and Times of Jesus of Nazareth"—a momentous work of popular scholarship, which reached #1 on the NY Times bestseller list. Dr. Aslan’s degrees include a Bachelor of Arts in religious studies from Santa Clara University, a Master of Theological Studies from Harvard University, a PhD in the sociology of religions from the University of California, Santa Barbara, and a Master’s in creative writing from the University of Iowa. The Hun School of Princeton is a co-educational, private day and boarding school in Princeton, New Jersey. Individual attention and strong student-faculty relationships are the hallmarks of the School. On the 45-acre campus between Philadelphia and New York City, student-centered, hands-on learning prepare students for the global community in which they will live and work. The Hun School is comprised of 629 students in its Middle School, Upper School, and Postgraduate Program. The Hun School is home to students from seventeen countries and fifteen states. Following his presentation, Dr. Aslan met audience members and signed copies of his books.Reza Aslan is the author of "Zealot: The Life and Times of Jesus of Nazareth"—a momentous work of popular scholarship, which reached #1 on the NY Times bestseller list.